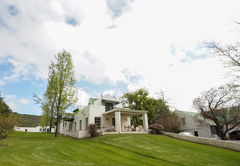 Knorhoek Country Guesthouse is a guest house with self catering option, providing accommodation in Stellenbosch for tourists visiting the Cape Winelands region. 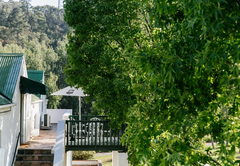 Situated under ancient oaks, flanked by vineyards and the Simonsberg Mountain, the guest house offers the unique combination of modern comfort and old-world charm. 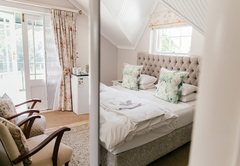 We offer tastefully decorated en suite bedrooms with crisp white linen and all the required amenities. 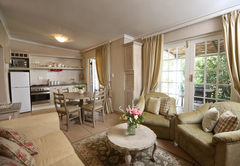 Patio rooms have a private stoep facing the lawn and garden and Loft rooms a balcony with a superb mountain view. 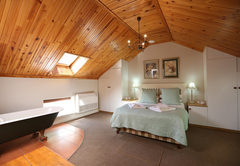 There are also two luxury cottages for those who wish to stay for longer periods. The patio rooms are all at ground level, facing a lawn and garden. 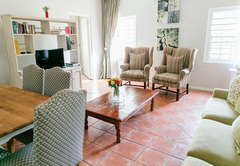 Each has a separate entrance and stoep with table and chairs. 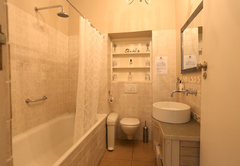 Each has an en suite bathroom with shower - towels, soap, shampoo, hand cream supplied. 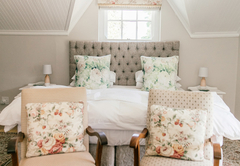 Coffee and tea-trays provided, free standing antique cupboards and dressing table and chair make up the furnishing of each room. 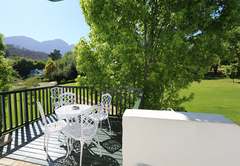 The spacious, tastefully furnished rooms upstairs have a balcony with spectacular view of the mountain and vineyards. 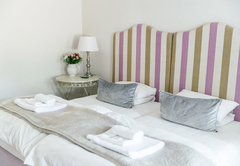 Guests can request the beds to be made up twin or king-size double. There are extra single beds for a third adult or children. 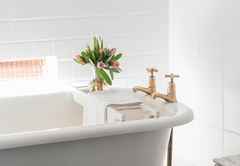 Rooms are equipped with white cotton percale bed linen, hot water bottles in winter, a hairdryer, all required amenities, shower, Victorian bath and TV with satellite bouquet. Towels, soap, shampoo and hand creams are supplied. Coffee and tea trays provided. Ideal for a couple who would like a large comfortable one bed roomed apartment or a family with two children (or four friends). 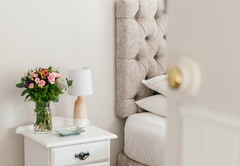 The bedroom is furnished with a Queen-size double bed, large sleeper couch, built-in cupboards and a charming old-fashioned dressing table. 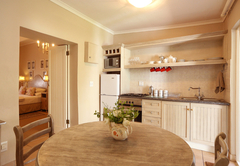 The kitchenette is fully equipped with microwave oven, fridge, washing-up basin, small stove and the usual utensils, crockery and cutlery etc. The lounge / dining room has an old oak table and chairs, lounge furniture, television with satellite bouquet and two single beds. There is a separate bathroom with shower and all required amenities. The suite is air conditioned. The Lavender and Rose cottages are semi-detached - the building is the original farmhouse, date of construction unknown. The walls are almost 1m thick and charmingly crooked in places. Restoration and redecoration of this building challenged the parties concerned and resulted in unique and interesting features in the cottages. 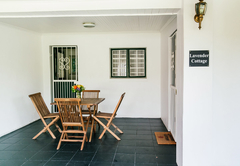 Situated 80m from the Guesthouse with a private entrance, garage and a garden shared with Rose Cottage. 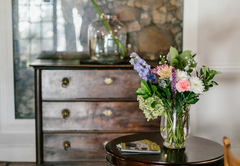 The cottage has a private patio with furniture, lounging chairs, private barbeque, fully equipped kitchen including washing machine. There is a beautifully decorated, spacious lounge with dining room table and television. 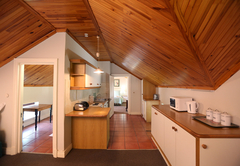 The two bedrooms (both ensuite), has two 3/4 beds and the other with twin beds. A coffee and tea tray is provided as is linen and amenities. 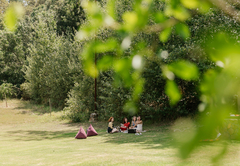 Children are most welcome at Knorhoek. There is a playground at the pool area where they can play under parents’ supervision. 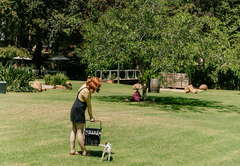 Camping cots are supplied free of charge. 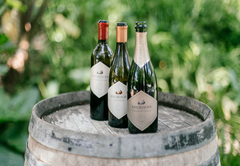 Knorhoek Wines boasts several local and international awards for Estate wines and blends. Cultivars harvested on the farm are Chenin Blanc, Sauvignon Blanc, Pinotage, Cabernet Sauvignon, Merlot and Shiraz. 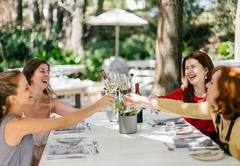 Wine tasting is enjoyed at leisure under the watchful eyes of the resident owls and private cellar tours with the wine maker by appointment. Lunches are served at Towerbosch Restaurant from Wednesdays to Sundays (if no functions). 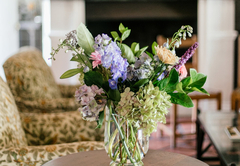 Scrumptious traditional evening meals are served from a set menu at the guesthouse from Mondays to Fridays. 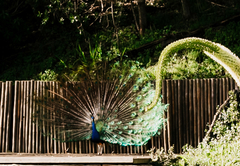 Knorhoek is ideally situated: historic Stellenbosch (10 minutes), airport (40 minutes) beaches (30 minues), Cape of Good Hope, Table Mountain and Waterfront (50 minutes), Hermanus whale watching (80 minutes). The ten top courses within 30 minutes drive from us. 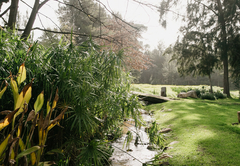 We are all golfers and have played most of the courses in the Western Cape. We shall advise you and book tee-times with pleasure. 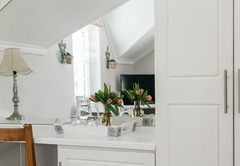 En suite with shower, private stoep facing the lawn and gardens; tastefully decorated with free standing oak furniture; tea trays; hairdryer; satellite TV bouquet. 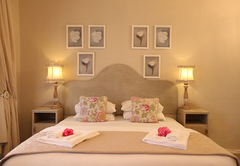 Once the booking is confirmed, Guests can request whether the rooms be made up with King size Double bed, or TWIN beds. 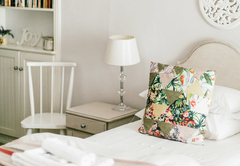 Spacious, tastefully decorated bedroom with free standing wooden furnishings. 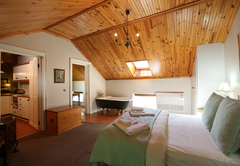 En suite bathroom with antique-style bath; private balcony with mountain/farm view; tea tray; hairdryer; wi-fi; satellite. 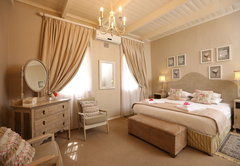 Once the booking is confirmed, Guests can request whether the rooms be made up with King size Double bed, or TWIN beds. The staff were very friendly and welcoming. The honeymoon sweet was very nicely decorated and had what we needed for a weekend. We really loved it here! 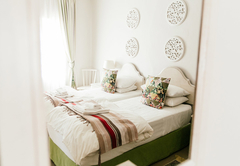 The rooms are very authentic with tiled floors and old elements. Felt like going back in time. We were welcomed with a nice glass of wine! Great rooms, nice breakfast, nothing to complain. 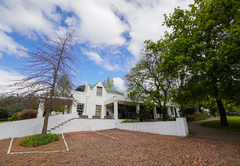 Response timeKnorhoek Country Guesthouse typically responds to requests in 5-10 minutes.